Soyuz capsule TM-8 flew to the Russian space station 'MIR', launching from the Baikonour Cosmodrome in the Kazakh Soviet Socialist Republic on September 5th, 1989 and returned on February 19th, 1990 in the Gobi desert, 55 kilometers to the northeast of Arkalyk, Kazakh Soviet Socialist Republic, after 166 days in space. Soyuz means "union" in Russian. Soyuz-TM is the Russian manned spacecraft that typically ferried three crewmembers to and from MIR. It was also available as an escape vehicle in the event Mir experienced a life-threatening situation, and was used as a "fly-around" vehicle in the vicinity of Mir. Soyuz-TM has a mass of 7,100 kilograms, a length of seven meters, and a maximum diameter of 2.7 meters. After re-entering the atmosphere, the Soyuz capsule deployed it's main landing parachute then fired braking rockets when it is just above the ground. It was a manned two crewman mission, named Mir Expedition EO-05. It docked with MIR on September 8th, in which transported to MIR a team consisting of Aleksandr S. Viktorenko, commander of the spacecraft, and Aleksandr A. Serebrov, flight engineer, to carry out scientific and technological research and experiments on the 8th manned expedition to the orbital station MIR, specifically installing a star tracker, collecting material samples, and testing the new 'SPK' maneuvering unit, which allowed the cosmonauts to float "untethered" in space. Also during this time, TM-8 performed the required change of the crew, unloaded "Progress M", docked and unloaded cargo spacecraft "Progress M-2", and docked with the new station module "Kvant-2". Souvenir Card with Launch Pad "White Room" Relic from STS-84 "Atlantis"
Shuttle mission STS-84 in May 1997 saw British born NASA Astronaut Michael Foale begin his highly successful stay aboard the Mir Space Station. 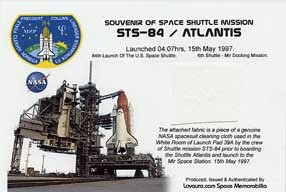 As a small memento of this mission, Lovaura.com received a couple of the cloths used to dust down the astronauts in the Launch Pad White Room prior to boarding "Atlantis". STS-84 Mission Specialist C. Michael Foale joined Mir 23 cosmonaut crew members, Commander Vasily Tsibliev and Flight Engineer Alexander Lazutkin, by replacing STS-81 mission specialist and Mir 23 crew member Jerry M. Linenger on Mir. 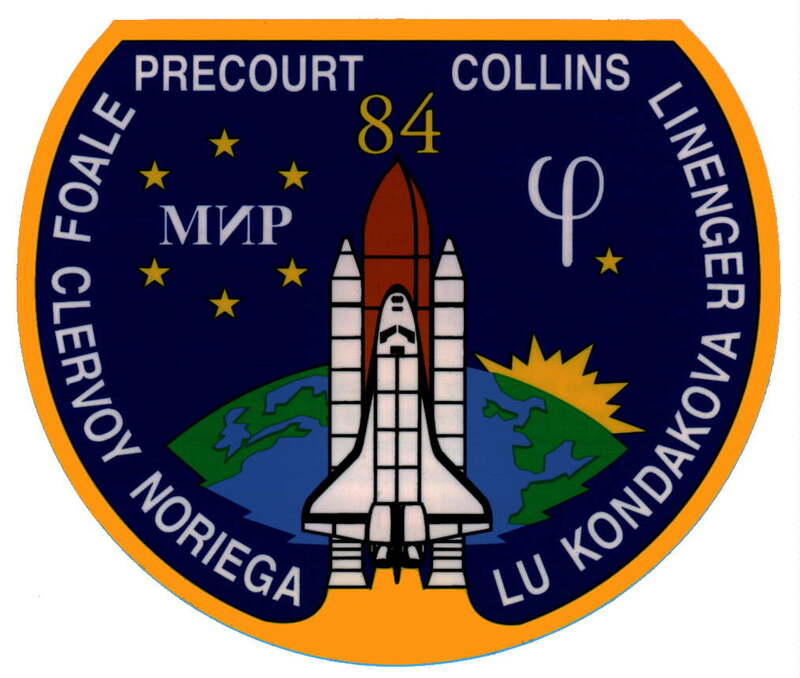 Linenger had been on the Russian outpost since Jan. 15, 1997, shortly after Atlantis last docked with Mir during the STS-81 mission. Foale was scheduled to remain on Mir for slightly more than four months when he was picked up by Atlantis (STS-86) in October of 1997 and returned to Earth. Due to customer demand, Lovaura.com sectioned one of these cloths, and samples mounted to a custom produced illustrated display card with declaration of authenticity. These are limited edition although not serial numbered. Each card measures 4" x 6" and carries a 1-2" section of the cloth as a small, inexpensive souvenir of Shuttle Mission STS-84 to Mir. Place your pointer over the photo to see the reverse of the medallion. The 103rd mission of the Space Shuttle, Space Shuttle Atlantis spent almost 13 days in orbit during STS-98, from February 7, 2001 to February 20, 2001, with seven of those days docked to the International Space Station. While at the orbital outpost, the STS-98 crew delivered and activated the U.S. Laboratory named Destiny and completed three space walks. The arrival of the Destiny Lab brought the space station's mass to about 112 tons, surpassing that of the Russian Mir space station for the first time. The crew of STS-98 were: Kenneth D. Cockrell as mission commander, Mark L. Polansky as mission pilot, Robert L. Curbeam as Mission Specialist, Marsha S. Ivins as Mission Specialist, and Thomas D. Jones as Mission Specialist. This canister launched on April 28, 2001 along with a roll of film, a copy of Popular Mechanics magazine and Dennis Tito. The film, the magazine and the canister were returned to Earth eight days later, landing in the desert of Kazakhstan. It was all a part of a promotion conducted by Space Media Inc, for Popular Mechanics. The film and magazine were returned to the offices of Popular Mechanics and the canister was just recently discovered in Space Media's offices. Soyuz TM-32 launched from the Baikonur Cosmodrome at 3:37am ET on April 28, 2001, carrying cosmonauts Talgat Musabayev and Yuri Baturin -- as well as the first "space tourist", American businessman Dennis Tito -- to the International Space Station. A so-called "taxi" flight, the crew returned to Earth nearly 8 days in the TM-31 spacecraft. Meanwhile, the TM-32 capsule remained at the ISS, serving as a lifeboat for the station's crew. Signed by Du-xiangzhong, Captain of the Recovery Helicopter.